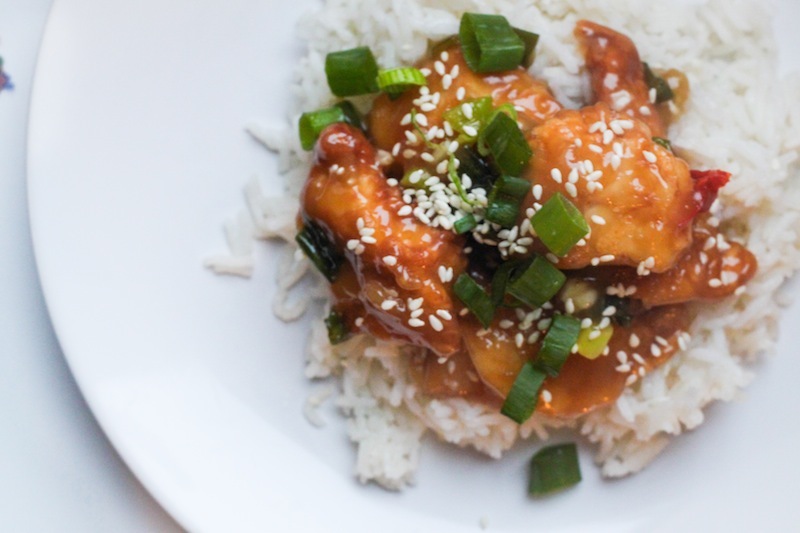 Lazy Days: General Tso’s Chicken – Eat Me. Drink Me. Sunday was a crave the buffet day. 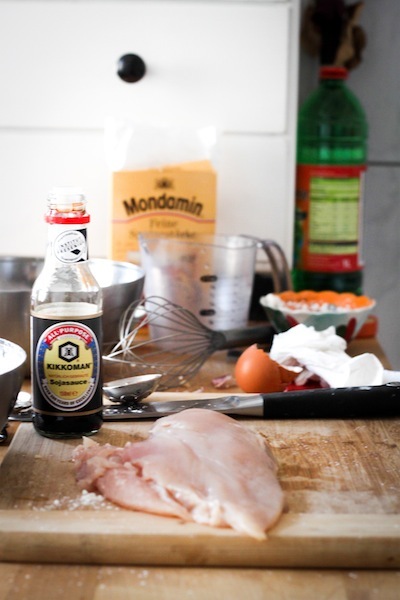 And surprisingly enough, the ingredients for General Tso’s chicken were for the most part staple pantry supplies I always have on hand – cornstarch, garlic, soy sauce, sugar, vinegar, eggs… I’d just never thought of making it on my own. The process is fairly simple, and perfectly suited for a lazy Sunday afternoon. You make a cornstarch slurry – an absolutely icky, putty-like paste of cornstarch, soy sauce, and egg – then coat the chicken with it. The chicken is deep fried in oil, and comes out in perfect golden nuggets of juicy meat without a trace of its hideous slurry past. You make a sauce of broth, wine, vinegar, sugar, and, of course, more cornstarch, and swirl it in some of the hot oil you used to fry the chicken. When the sauce starts looking like a pot of glue, you add the chicken and toss to coat. It’s just like buffet-made: gelatinous, sticky, sweet, salty sauce-covered chicken pocked with white sesame seeds. And utterly unhealthy. Don’t be disheartened by the pale white color of the sauce or the goopy look of the cornstarch slurry. This dish relies heavily on the magic chemistry of cornstarch and heat to make great things happen. The sauce won’t be quite the same orange color as buffet General Tso’s, but the flavor is all there. Adapted from this recipe on food.com. 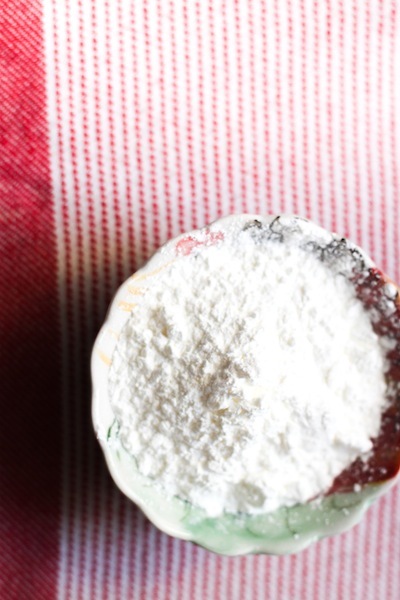 To make the sauce, combine all ingredients and whisk until the cornstarch has dissolved. Set aside. Re-whisk the sauce before use. 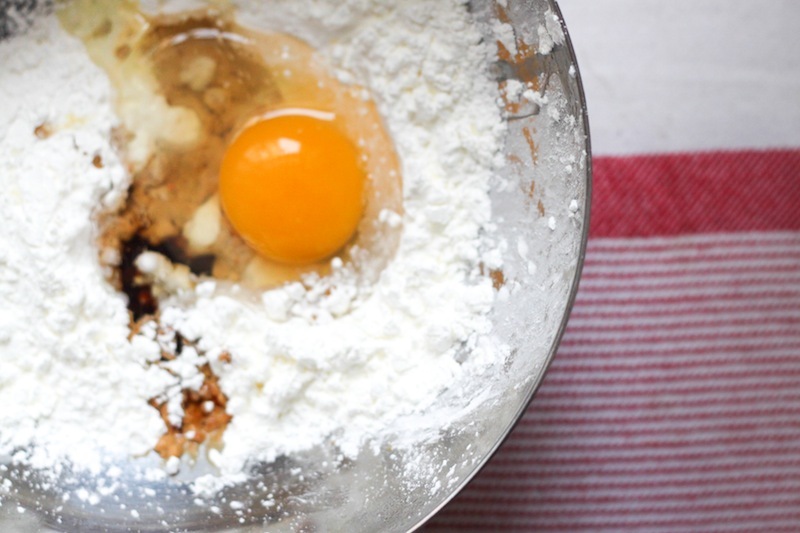 Make a cornstarch slurry by mixing together the soy sauce, egg, and cornstarch until well-blended. It will be a very thick, unappetizing-looking sludge the color of an 80’s tan velour sofa. Not to worry – this is just the way you want it. 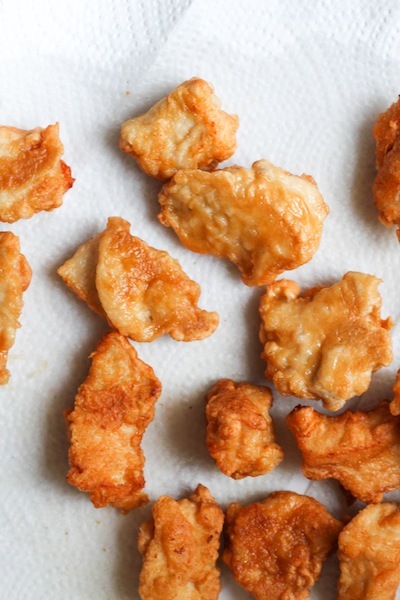 Wash and dry the chicken breast, then cut it into bite-sized pieces. Add chicken to the cornstarch slurry and toss with your hands to combine. Make sure the chicken is thoroughly coated. Heat enough vegetable oil to generously cover the bottom of a large skillet (preferably, the oil will have at least ½-1 inch depth). When it is very hot (flick a drop of water into the skillet, and if it sizzles loudly at you, it’s hot enough), drop the chicken one piece at a time into the oil. Cook in batches of 8-10, taking care not to overcrowd the skillet, as it will lower the temperature of the oil too quickly, making the chicken will soggy. Drain each batch on paper towels. When all the chicken has been cooked, discard all but 3 tbsp. of the cooking oil. 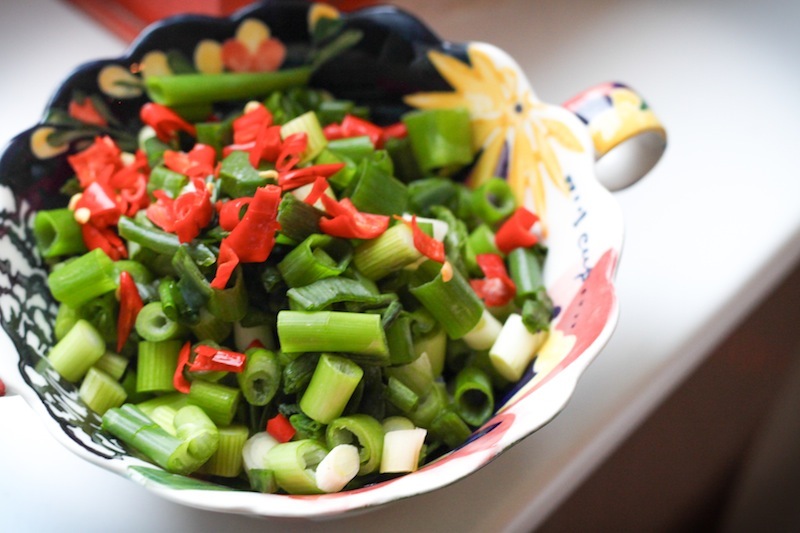 Add green onions and chilis and cook until just softened, about 1 minute. Re-whisk the sauce, then add to the skillet. Cook until the sauce thickens, about 3-4 minutes, then add the chicken pieces. Coat with the sauce and keep on the stove just about a minute longer. 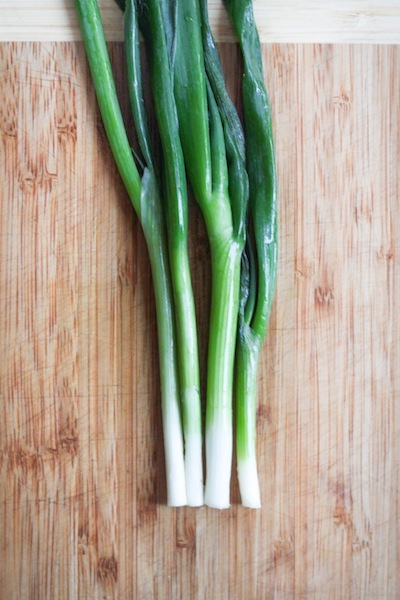 Garnish with sesame seeds and green onion. Serve over basmati rice. Makes me hungry for some General Tso’s Chicken (American Version) ! 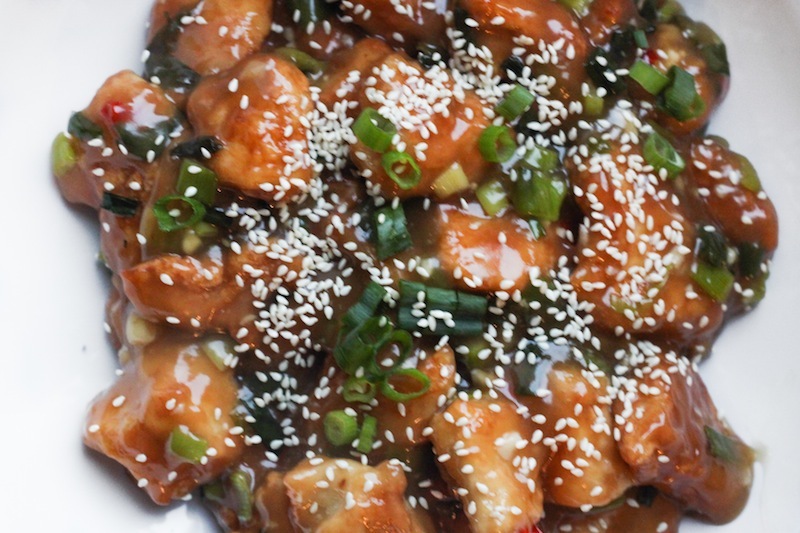 Your General Tso’s is picture perfect. However, BTW, all the food I ate in China was fabulous, and way, way hotter… a delight for those of us who love hot food.